574. His death happened at that time in such a way that he fell (Note by CF: not just from standing to the ground, but some distance down) – caused by an epileptic fit –and was severely injured by one of his own arrows when he fell on his back, just at the moment when a primeval ice storm started. 575. As a member of a group of 14 persons who had camped there in the mountains, he was left laying on the ground because of his critical injury. Since the remaining 13 human beings were fully occupied with saving their own lives, they did not care for him. 576. Nevertheless, not all of them survived, as several of them died in the ice needle storm. 577. The storm covered the mountains under (a) thick (layer of) ice, and in it the corpse of the “fallen one” remained mummified and preserved until today; so it (he? the corpse) will be found this year around the 20th of September by a mountain hiker, together with his equipment, like clothes and weapons, etc. 8. ..he was not murdered, because in reality he lost his life through an unlucky fall because of an epileptic fit. One of the arrows that he had taken from the dead ones pierced his body, and he was left to his fate by his companions, from whom several had also lost their lives in the storm. That’s the real truth regarding Urk’s death. We shall now discuss the two causes of death of Ötzi which according to Meier's Rep. Michael Horn, was allegedly published by Meier before scientists discovered the causes. As you can see from the above excerpts from Contact Reports 238 & 347, the only reason ET told Meier, on the death of Ice man was due to the arrow (he was carrying on him) that has pierced his "back", when he fell from some height. In Part 1/4 and Part 2/4, we have shown that this cause of death - ARROW - was only added later in FIGU publications after the arrow was discovered by scientists in year 2001. "Articles published in National Geographic magazine and the journal Science confirm information first published by Swiss prophet Billy Meier years before. In 2002, National Geographic reported that scientific testing, done a year early, at an Italian hospital determined the cause of death of the 5,100 year-old Iceman. The mummy, called Otzi by the scientists because of the region in the Austrian Alps in which it was discovered, had an arrowhead lodged in its back, leading the scientists to conclude that the cause of death was murder at the hands of others. In 2007, National Geographic updated their information in the second article they published on the story, adding that a head wound had contributed to the circumstances causing the Iceman’s death. Meier had already Published BOTH Causes. However, Billy Meier had already twice published the information pertaining to the discovery, and circumstances accounting for the death, of the Iceman, first in1991 and then in again in 1996. According to Michael Horn, Meier’s American media representative, “Meier’s publication with the copyright date of 1996 eliminates any possibility of backdating. It’s five years before ‘official discovery’ of the arrowhead and 11 years before the head injury was added to the official causes of death. Scientists recently discovered a stony platform some 20 feet above where the mummy was found. The newly confirmed head injury is completely consistent with what Meier was told by the extraterrestrial who gave him the information. It plainly states that the man fell – very hard since the German word used means to crash – and that he landed on his back and on his arrow. Let’s also remember that a broken arrow was also found near his body." Horn added, “Is there some magical way that a man falling that hard, presumably from some height, and landing on his back in a rocky region DOESN'T hit and injure his head, and quite severely at that? And with all of the possible ways a person could die, 5,100 years ago in a cold, rugged mountainous region, how did Meier know it was from a fall and an… arrow – which scientists confirmed all of these centuries later?”"
Sounds like a non sequitur, isn't it ? Michael Horn draws the connection between Meier's published information (since Jan 1992 in SWZ Nr.79/2) that Ice man fell from some height and the results of the 2007 analysis, where it says that the severe head trauma added to the lethal arrowhead wound in the shoulder that killed Ötzi, despite Meier or FIGU having never mentioned this as the cause of death in any of their publications in all these years. ETs/Plejaren would certainly have mentioned the head trauma as being another cause of death during their own "investigation" but they didn't and instead they have just mentioned ARROW as the only cause of death. Despite this major objection, FIGU Passive member & Meier case Rep. Michael Horn insists otherwise, which apparently is just pure speculation. The lack of any mention (in FIGU publications) of consequences from Ice man's fall (head trauma) until after the scientific results came out in 2007 and the later addition of ARROW cause only after scientists discovered it in 2001, further supports the null hypothesis. Meier/ETs have said that Ice man fell on one of his "own" arrows that pierced his body when he fell due to an epileptic fit just at the moment when a primeval ice storm started. What do the scientists & experts say on how the ARROW pierced Ötzi's body ? The leading scientific theory is that the arrow was fired upon by an attacker(s) with whom Ötzi had a violent fight shortly before his death & who has/have been chasing him. Following are some of the points that supports the theory of a violent attack rather than a self-inflicted wound. Critical parts of the Ice Man's equipment were in extremely poor shape or missing altogether. This supports the theory that Otzi was involved in a violent fight with other humans shortly before his death and has fled from his village in a hurry. 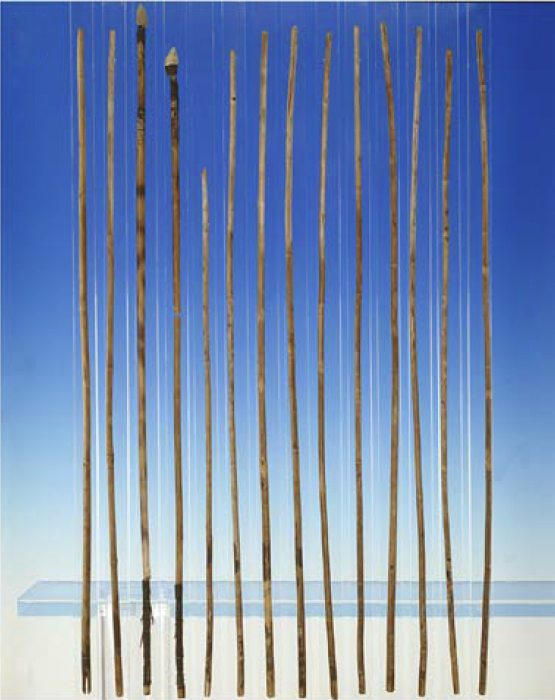 Quiver: The supporting strut for the quiver had already been broken in three during Ötzi’s lifetime. Bow: Clear traces of carving on the surface – expertly and carefully executed axe cuts – show that the bow was still unfinished. On prehistoric bows the bowstring is usually attached to one end of the bow by means of a loop and bound at the other end. But Ötzi's bow has no sign of a bowstring. Arrows: 12 unfinished arrow shafts and 2 finished but broken arrows with flint arrow heads. See the image of 14 arrows under point 8. Ötzi suffered deep wounds on his right hand and wrist suggesting that the Iceman was involved in hand-to-hand combat hours or days before his death. A few centimeters below the arrow entry wound, scientists have detected an additional small discoloration of the skin, which was probably caused by a blow from a blunt object. This supports the theory that Otzi was involved in a violent fight before his death. Ötzi was found holding a dagger in his right hand (when his corpse was discovered in 1991) suggesting that the killer was close and he was trying to defend himself. 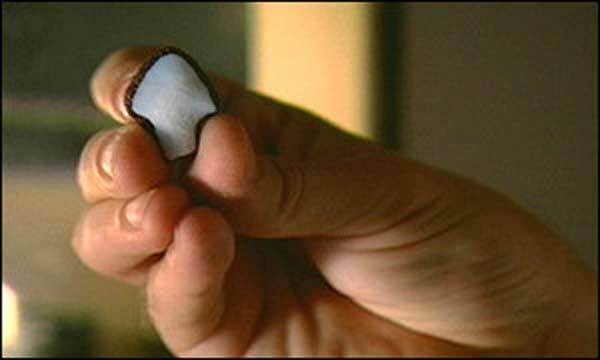 Why would a person hold a dagger in his hand until his death, if he fell on an arrow (that caused a laceration to the artery, which would cause massive bleeding and cardiac arrest) and die within minutes after the arrowhead struck ? "Scientists have compelling new evidence to suggest that the attacker may have finished the Iceman off with a final blow to his head. Basically we see a major head trauma. It's hard to tell whether its deadly or not. The extent, the shape, the location looks more like it would have been caused by an active blow rather than just by a passive fall of the body." But some other scientists seems to maintain that it's not conclusive whether Ötzi's brain injury was caused by being bashed over the head or by falling after being struck with the arrow. "The realization that someone pulled the arrow out of the Iceman's back came from another medical revelation. The high definition CT scans showed that the arrow point had been forcefully retracted from the pierced artery." 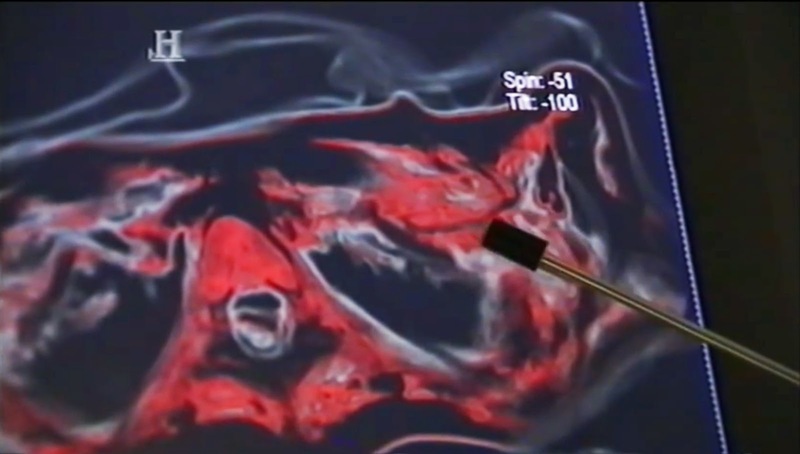 "This new medical evidence suggests that an attacker, positioned behind and below his victim, fired a single arrow that struck the Iceman's left shoulder blade—precisely the area at which prehistoric hunters aimed to bring down game (Note: 'game' means wild mammals or birds hunted for sport or food) with one shot. The arrow went clean through the bone and pierced the artery. Blood instantly began to gush out, filling the space between the shoulder blade and the ribs. In his few remaining minutes of life, the Iceman became a textbook case of what is now known as hemorrhagic shock. His heart started to race. Sweat drenched his garments, even at an altitude two miles (three kilometers) above sea level. He felt increasingly faint because not enough oxygen was reaching his brain. In a matter of a few minutes, the Iceman collapsed, lost consciousness, and bled out." Ötzi was found in a strange position with his stomach on the ground, leaning over a rock & face-down. At 18:50 min of the same 2008 documentary, the experts - Frank Rühli (paleopathologist) & Albert Zink (biological anthropologist) reenacts how this strange position could have come about - (killer) taking Iceman's right arm and rolling him towards his left side, in order to pull out the arrow shaft from his body. ""I believe—in fact, I am convinced—that the person who shot the Iceman with the arrow is the same person who pulled it out," says Egarter Vigl (Note: chief pathologist at General Regional Hospital in Bolzano). In an article that appeared this May in the German archaeology magazine Germania, Egarter Vigl and his colleagues noted that telltale markings in the construction of prehistoric arrows could be used to identify the archer much in the way that modern-day ballistics can link a bullet to a gun. They argue that the Iceman's killer yanked out the arrow shaft precisely to cover his tracks. For similar motives, Egarter Vigl reasons, the attacker did not run off with any of the precious artifacts that remained at the scene, especially the distinct copper-bladed ax; the appearance of such a remarkable object in the possession of a villager would automatically implicate its owner in the crime." “Specifically, they took samples from the Iceman's antler-skinning tool, his stone-tipped knife, two of his arrows (one broken), his axe handle, and his goatskin coat.”"
It turns out that it is not one arrow that is broken but two arrows. And moreover, the word "broken" was perhaps misunderstood by Michael. The word doesn't necessarily imply that a part of the arrow i.e., either the arrowhead or shaft is totally missing. Michael is assuming that scientists have found the arrow shaft near the Iceman's corpse, whose arrowhead had pierced the Iceman's left shoulder; which of course is incorrect. In this context, the word 'broken' just means that what it means, which is that the two arrows are broken i.e. each arrow is disjoint/broke at some place on its continuous body and no part of it is either missing or lost. In the below image, we can see all the 14 arrows contained in the quiver, only two of which had feathers and flint arrowheads attached, but these two were broken; and the rest are unfinished and untipped. No part of these 14 arrows is missing or lost. Now we will present some excerpts from different sources on why the self-inflicted arrow wound theory is rejected by scientists. "“Ötzi certainly died a violent death,” says Eduard Egarter, the pathologist involved in the discovery. That the Glacier man, exhausted from the arduous scramble, collapsed on his own arrow is ruled out by Egarter and his colleagues: “We were able to refute this theory.” Also a hunting accident is also considered unlikely by the scientists." Following is an excerpt from 2003 article on the conclusion reached by Thomas Loy, an archaeologist and molecular biologist at the University of Queensland, Australia. He suggests that the arrowhead must have been removed by another person (a companion, he speculates). "Loy, who is an expert on prehistoric tools and weapons, concluded that Ötzi could not have removed the arrow from his back by himself." "The second proposition is of an accidentally self-inflicted wound; the possibility that Otzi was accidentally hurt by one of his own arrows appears to be extremely remote in my opinion. As an archer and hunter it seems to be absolute fantasy that an accidental arrow can perforate a thick fur jacket, shatter the shoulder blade and then deeply penetrate the shoulder muscles, finding itself in the position it was when the body was detected. Fanciful, even if it were virtually possible. Experience shows that a modern hunting arrow (and those flint arrow heads were certainly no less effective) can be dangerous if badly handled. A flight from a position in a tree (falls from tree-stands are the most common cause of hunting accidents) with the arrow nocked, ready to be shot, can certainly be dangerous, but likening this scenario of the Iceman seems decidedly hazardous and it would be the first case of this kind due to its characteristics." Now, we are going to present a couple of excerpts from news articles that talks about the difference in design between the arrowhead that was lodged in Iceman's back and the two arrowheads that were attached to the two arrows, found in Iceman's quiver. This, scientists suggests, adds further support to the theory that Ötzi must have been killed by his enemy, and so by the enemies arrow. "...Egarter Vigl and Dr. Gostner (chief radiologist at the Bolzano hospital)..Neither man believes the Iceman could have injured himself by falling on an arrow...Dr. Annaluisa Pedrotti, an archaeologist at the University of Trento...said the..type of arrowhead in the Iceman's body appears to differ very little from two arrowheads found in his quiver." In this section, we have shown that despite Meier's Rep. Michael Horn's corroboration claim, there is no evidence at all to suggest that Meier/ETs presented the Head Trauma as one of the causes of Iceman's death. Also we have presented abundant evidence (9 reasons), that outright rejects the self-inflicted arrow-wound scenario which according to Meier/ETs, lead to the death of Ötzi. We shall now discuss the various events leading up to Ötzi's death. Information on Ötzi in Contact Report 347 starts with Meier showing ET-Ptaah, an article - Ötzis letzte Stunden (Ötzi's last hours) - from the Zurich newspaper (Tages-Anzeiger) that was published on the same day as the day of the contact that allegedly occurred between Meier & ET i.e. on Tuesday, August 19, 2003. The following is a rough English translation of some excerpts from that article. 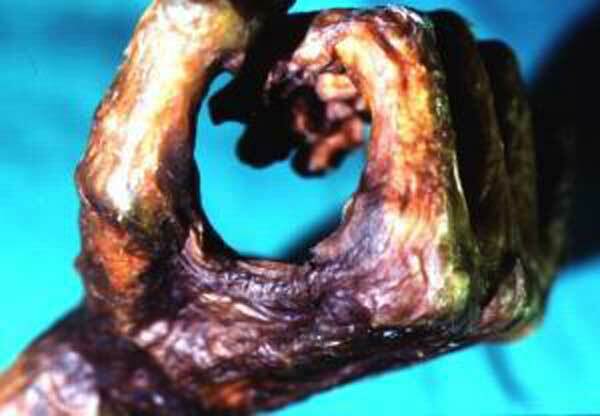 "The Iceman has fought valiantly before his death – a new study says. The Australian Loy now musters this thesis additionally with spicy details about Ötzi's presumed fight to the death. They throw a bad light on the interpersonal practices of our alpine ancestors from the Stone Age. And on the contemporaries of Ötzi." What did ET say after reading this article ? 4. Really astonishing what those specialists have found out, but the supposition, that Urk has been involved in a fight, is not in line with the facts. 5. Truth is that Urk, together with his 13 comrades and in the Oetztal Mountains, was observing a fight to the death between six human beings of two rivalling groups or tribes, respective, who were killing one another. 6. When they were dead or dying, Urk and his companions come forth from their hiding-place and were unsuccessfully caring for the dying, and during this process Urk and also his companions were besmirched with the blood of the critically injured. 7. And since Urk’s weapons were quite battered from the many years of use, he took parts of the weapons and also of the garment of those, who had already died, and of those, who were dying under his and his companions’ hands. 8. Urk really wasn’t involved in the fight, as it was also the case with his companions, and he was not murdered, because in reality he lost his life through an unlucky fall because of an epileptic fit. One of the arrows that he had taken from the dead ones pierced his body, and he was left to his fate by his companions, from whom several had also lost their lives in the storm. That’s the real truth regarding Urk’s death. Now let us analyse just the three important claims (points 2, 3 & 4) made by ET-Ptaah after reading the 2003 newspaper article. In Section 1 under the 'Causes of Ötzi's death-Arrow', we have already presented many lines of evidence supporting the theory that Ötzi was involved in a fight a few hours or days before his death. So the claim that Ötzi was never involved in any fight seems incorrect. Also we have shown in section 1, the claim that - the cause of his death being a self-inflicted arrow wound (occurred due to a fall) - seems to be incorrect as well. Though it is not virtually impossible, but the death of all the involved six fighters from 2 rival gangs fighting each other, sounds cliche & reminds oneself of the scenes from old Hollywood Cowboy movies. The main objection to the claim that Ötzi took parts of the weapons from the 6 dead or dying persons is the condition of the weapons that were found along with Ötzi's corpse. In Point #1 under 'Causes of Ötzi's death-Arrow', we have shown that the weapons & equipment like bow, most of the arrows & quiver were either unfinished or broken - meaning they are useless in combat & the person(s) using them would most certainly die in a fight with an enemy who has finished weapons. Why would anyone carry 12 unfinished arrows to a fierce fight that lead to their & their groups death ? Why would anyone carry an unfinished bow that also has no sign of bowstring to a fierce fight that lead to their & their groups death ? Why would anyone carry a quiver whose supporting strut was broken in three to a fierce fight that lead to their & their groups death ? One could argue in many ways to counter this major objection. For example, it could be argued that perhaps the persons involved in the battle actually used only finished weapons (bow, arrows,..etc) or other finished weapons (like axe, dagger,..etc); and that the unfinished weapons were only brought along in case when the already finished weapons becomes damaged or lost. Still another variation is that one unsuspecting group with unfinished weapons from one tribe were ambushed by the enemies from another tribe. All the information in the Contact Report 347 on the topic of Ötzi, is actually provided in the form of a response by ET-Ptaah after reading the newspaper article which was pointed out to him by Meier. After reading the newspaper article, Ptaah completely acknowledges all the scientific findings (see CR 347, verse 4) but rejects the 'battle theory' (in which Ötzi gets involved in the fight) as was speculated by the Australian scientists. Instead, later in the contact report, Ptaah provides the "real" background story or facts behind the following scientific claims as was reported in that newspaper article. As it turns out, both of the claims were proven to be absolutely wrong! First, the number of individuals (other than Ötzi) whose blood traces were discovered on weapons and clothing is not '6' but just '4'. We have checked many articles from around the same time (August 2003) as the newspaper article (Tages-Anzeiger) which was read, acknowledged & commented upon by ET. And in all of them, the number of individual blood traces was said to be '4' and not '6'. For example read this Der Spiegel (Aug 13, 2003) & National Geographic (Oct 30, 2003) articles. Apparently, the author of the Tages-Anzeiger article seems to have made an error on the number of different individuals blood traces. As it turns out in later investigations conducted in 2008 by the scientists from Bolzano’s EURAC Institute for Mummies and the Iceman, they didn't at all find & could not confirm - any traces of blood belonging to '4' different individuals on the weapons and equipment as was mentioned in the 2003 sensational findings! Read these original German articles from August 2008 - No human blood on the ax of Ötzi & Ötzi rehabilitated. A rough English translation of the above two articles was also made available here & here respectively. You can also read the same information from other newspaper articles - Tageszeitung & Südtirol aktuell - at around the same time (July-Aug 2008). In order to verify whether the scientists actually did confirm the above likely sources of blood traces, I have written directly to Prof. Dr.Albert Zink, Head of Institute of Mummies & the Iceman, EURAC. Here is our correspondence. My name is Mahesh Karumudi, an independent skeptic from India. Lately as a part of my research, I have been looking into the Otzi's case. I have noticed that in 2008, it was said that the 2003 analysis made by Tom Loy, an Archaeologist from the Australian university Brisbane was not correct, as the blood traces (speculated to be from four different individuals) could not be found on the tools. But it was said that traces of blood was found on Otzi's coat and grass mat. And suggested that the future research will reveal the source of these traces of blood. Now, I would like to know, whether this research has been done and the source of blood was revealed (animal or Otzi's or other person) ? I searched online but could not find any research papers on it. Kindly point me out if this research already has been done. You are right, we started a re-analysis of the Iceman's tools and equipment in 2008 and we found differences of the distribution of blood spots compared to the work of Tom Loy. After the first detection of blood traces on the Iceman's coat and grass mat we experienced some methodological problems to further analyze the blood stains. Early this year we finally could solve these issues and we are currently analyzing the blood traces. We have first indications that it is his own blood, but we are waiting for a final confirmation. Up to now, we haven't published our findings, but we hope to publish the results as soon as possible. This information really helped us a lot, Mr. Zink. There is one more thing which I forgot to include in my earlier mail. Sorry for that. In this 2008 article, it mentions traces of blood also being found on the shaft of the arrow during the investigations carried out in 2007. And it was speculated that it could belong to animals. "Die Untersuchungen des im Jahr 2007 eröffneten Eismann-Instituts an Ötzis Waffen brachten nur geringe Spuren von Blut an einem Schaft ans Tageslicht, und die könnten von Tieren stammen." Have your recent investigations confirmed this 2007 result or not ? If yes, then may I know, the source (animals or humans ?) of this blood on Otzi's arrow shaft ? In our recent analysis we are focusing on the Iceman's clothing and the copper axe and knife. We have no new results for the shaft so far. As you can see, Mr. Zink clearly said that the results of the new preliminary investigation suggested that the source of the traces of blood found on the coat and grass mat as belonging to Ötzi. He also noted that they didn't yet investigate the blood found on the arrow shaft, whose likely source was said to be animals, according to the 2008 study. Was animal blood ever reported to be found on Ötzi's tools ? Before going into the next section, let us first ponder on a couple of important questions & present what the skeptics would or could argue. Why would ET/Meier reject the 'battle theory' (Ötzi gets involved in the fight) in CR 347 and instead stick to the self-inflicted arrow-wound theory (SAW) even when the evidence for the murder/battle was published in the media in 2001, 2002 & 2003 ? 574. His death happened at that time in such a way that he fell down because of an epileptic fit and was injured, just when a primeval ice needle storm broke out. 574. His death happened at that time in such a way that he fell caused by an epileptic fit – and was severely injured by one of his own arrows when he fell on his back, just at the moment when a primeval ice storm started. Here skeptics would argue that it would be relatively easy for a number of reasons* to "add/insert" a new story (in new publications) at the end of the already mentioned series of events that starts with Iceman getting an epileptic fit rather than to "add/insert" a new story before the beginning of the already mentioned series of events. As you can see, it is easy* to transform the sentence A into B but not easy* to transform the sentence A or B into C. Moreover, if we just consider sentence C, the chronology of events would suggest that either the epileptic seizure was caused by the arrow shot by enemy or somehow both the seizure and arrow events occurred at exactly the same time causing the Iceman to fall from some height. The former, contradicts what Meier said in earlier publications, which is that there was no clear cause given for Ötzi's epileptic seizure suggesting that it could be due to natural causes (ex: severe cold). And the latter can only be called as a weird "coincidence" (strangely one among the many in the Meier case). Why would ET/Meier say that Ötzi took some of the weapons & equipment from the "6" dead or dying people and that Ötzi himself was killed by one of these stolen arrows & not by one of his own arrows? Since the first publication of information on Ötzi's topic since 1992, it was mentioned in the contact reports that Ötzi's origin was located in the banks of Lake Zurich, Switzerland. So the natural consequence of it is that all of Ötzi's weapons (material & design) and equipment (clothes, types of food,..etc) should match the identity of a person whose origin is Switzerland. So according to skeptics, Meier has no choice but to stick with his Switzerland story. In all earlier publications of Contact Report 238, all the equipment with Ötzi was referred to as "his" suggesting that they all belong to Ötzi. 577. The storm covered the mountains under thick ice, and in it the corpse of the “fallen one” remained mummified and preserved until today; so it will be found this year around the 20th of September by a mountain hiker, together with his equipment, like clothes and weapons, etc. After the arrow was discovered in Ötzi's body in 2001, the Contact Report 238 was edited to include the new discovery. And in this new edited report too, it was still being mentioned that he was killed by one of his own arrows. But one year later in 2002, scientists suggested that the arrowhead lodged in Ötzi's body could only come from "southern alps and in northern Italy" & so it was suggested that the enemy who killed Ötzi should also come from northern Italy. Also the botanist, Klaus Oeggl around the year 2000, "examined the seeds that were found in and on Ötzi and his gear. His conclusion was that all items originated from the south, just like the assassin". Moreover in 2003, traces of blood belonging to "6" different individuals was discovered on Ötzi's axe, dagger, arrow & coat. All these findings obviously contradicts the information contained in the above verses 574 & 577. What is the best & the easiest way out of all these contradictions ? Skeptics could argue that Meier by introducing his new story which is that - Ötzi took weapons and equipment from the dead or dying people (who it can be easily suggested would be native to northern Italy) & was also killed by one of these stolen arrows - is able to address all the three contradictions as reported above with one go. According to skeptics, Meier seems to have shot himself in the foot when proposing the ‘epileptic fit’ story in 1991 which doesn't anymore fit the new evidence regarding the arrow and the blood traces, so he had to come up with an explanation for that while keeping the epileptic fit story intact. So the skeptics argue that the information in the Contact Report 347, is a perfect example demonstrating the null hypothesis that - Meier/FIGU follow the scientific discoveries/findings or any information reported in the newspaper articles, science papers, science magazines,..etc & uses them as the basis for their publication of contact reports. In Part 2/4, we have mentioned that we would notify you whenever FIGU Core Group member, Hans George Lanzendorfer responds to our set of questions regarding his Ötzi article published in FIGU Bulletin 47, April 2004. Recently, he sort of responded. Following is our correspondence (rough English translation). How can one consider the ‘Ice man case’ as evidence for Meier’s contacts with extraterrestrials, when the information was only published after the Ice man was discovered by hikers? Why should unbiased scientists pay attention to Meier’s information regarding the ice man, when it was only published after the discoveries were known world wide? Could you provide any evidence that Meier really documented information regarding the Ice man before the discovery on September 19, 1991? He finally responded on Facebook on October 3, 2014, 15:30 after I reminded him on the same day at 13:38. Hans-Georg Lanzendorfer: With my article this topic is closed! Dumbfounded by his response, I again wrote to HGL in Facebook on October 3, 2014, 22:21, as follows. Well, when I really wanted to get to the bottom of this, I only find that until now nothing was published by FIGU that was really corroborated after the FIGU publication; and that critical information regarding the age of the Ice man corpse and the arrow was simply altered or added afterwards according to new scientific findings. And when I wanted to ask questions about that, then you don’t want to answer my questions. What is the problem? Is it a lack of time? Are my questions too uncomfortable? Are discussions and critical questions regarding the validity of evidence a taboo in FIGU? Please explain this to me, because this way of dealing with such issues is incomprehensible for me. To which HGL responded as follows on October 4, 2014, 13:26. Hans-Georg Lanzendorfer: Ask your questions on the Figu Forum! Expecting a response, I have posted the same question again on FIGU German forum on October 4, 2014, 18:25. Till today got no response at all from HGL. On October 22, 2014, 16:46, I again posted a new question on the same topic, which again was ignored. In your article - Gletschermann Urk, Häuptling der Suren vom Zürichsee Oder: Wer suchet der Findet - published in Stimme der Wassermannzeit Nr. 88, Jahrgang 19, September 1993, page 11, you claimed that the age of the Iceman-Ötzi as 4105 years and that the scientists were unable to find the true age of the Iceman because they use false scientific interpretations and calculations yielding the wrong value of 5,300 years. But in your article - Neues vom Gletschermann <urk> der Sure - published in FIGU Bulletin Nr. 47, Jahrgang 10, April 2004, you mention an age of the corpse of 5105 years, without specifying why the age has been changed to a higher value, which by the way in your 1993 article was rejected by you. Can you explain why the age of the corpse was changed? It is obvious that FIGU Core Group member, Hans George Lanzendorfer is ducking the critical questions & seems to be distancing himself from his own written articles in which he lashes at scientists and experts for not paying attention to Meier's information; a behavioural response which is not uncommon among a section of FIGU & pro-Meier/FIGU members. How can a community (FIGU) that openly criticizes religions, sects, almost all politicians & scientists,..etc and at the same time promotes values like truth, knowledge, logic, reason,..etc, be so closed to any critical questions regarding their own information ? Let us put together all the conclusions we have arrived at so far in this part 4/4. In this section, we have shown that despite Meier's Rep. Michael Horn's corroboration claim, there is no evidence at all to suggest that Meier/ETs presented the Head Trauma as one of the causes of Iceman's death. Also we have presented abundant evidence (9 reasons), that outright rejects the self-inflicted arrow-wound scenario that, according to Meier/ETs, lead to the death of Ötzi. It is obvious that FIGU Core Group member, Hans George Lanzendorfer is ducking the critical questions & distancing himself from his own written articles in which he lashes at scientists and experts for not paying attention to Meier's information; a behavioural response which is not uncommon among FIGU & pro-Meier/FIGU members. How can a community (FIGU) that openly criticizes religions, sects, almost all politicians & scientists,..etc and at the same time promotes values like truth, knowledge, logic, reason,..etc, be so closed to any critical questions regarding their own information ? They will argue that the quantity and quality of the counter-evidence so far presented in all the 4 parts suggests that Meier obviously made up the Ice man story by simply - copying & later editing - the scientific findings published in the media as the basis for his contact reports. And the seemingly evasive behaviour by FIGU Core Group Member Hans George Lanzendorfer to the critical questions posed on his own articles suggests that either Meier or FIGU didn't expect these ugly truths to come out to the open which they might have wished them to be buried under the rug. Who recognize the importance of evidence, would be very disappointed after knowing that so-called evidence which according to Michael Horn, allegedly made Astronaut Edgar Mitchell 'fascinated by proof of extraterrestrial's accurate scientific information about 5,100 year-old Iceman' & also being promoted by Michael Horn himself in all these years through his several articles - 2008, 2009, 2010 & 2014 - as a poster boy for Meier's - "specific, prophetically accurate information", "irrefutable fact", "obviously impossible to back-date", "absolutely accurate, scientifically corroborated information" & "verifiably published with ironclad copyright dates" - turned out to be exactly the opposite. I am very grateful for James Moore for providing me the excerpts from Stimme der Wassermannzeit publications, which are crucial for this investigation. Also I wish to thank Brian Tone Covington for his donation of the ICEMAN (2001) book, which really helped us a lot in familiarizing ourselves with the story of Iceman, its discovery & scientific findings. Special thanks to Simon Goudswaard for providing me with the rough English translations of German material. Last but not least, I want to thank my sister Pavani for questioning my beliefs & pointing out any biases or mistakes that I have overlooked while investigating the Iceman issue which has been going on for more than a month.